The lightness of filigree design can make you feel feminine and pretty. 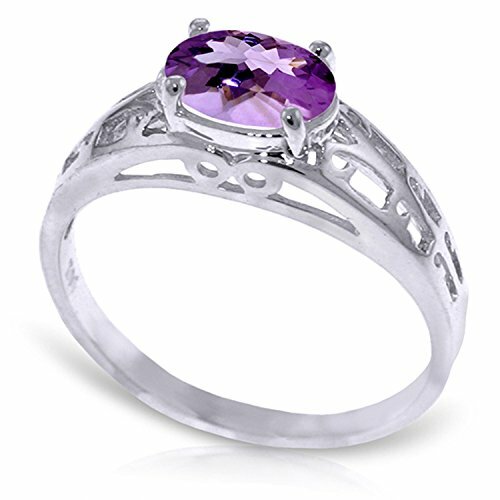 Enjoy that feeling when you wear this 14K white gold Filigree Ring with Natural Purple Amethyst. This dainty ring features a shimmery 1.15 carat oval shaped faceted Amethyst gemstone that measures approximately 7X5 mm. This beautiful purple semiprecious beauty is set on an elaborately detailed 14K white gold band. The cutouts on the band of this ring give it a lot of dimension and interest that is sure to get noticed. It is just SO PRETTY. Add this Amethyst beauty to your jewel box and you will cherish it forever.